You hear it time and time again. As a home seller, or just as a homeowner, you need to declutter your home. Get rid of your built-up storage, reorganize and make your house look spacious, empty and clean. As with most advice, the job is easier said than done. So how do you begin the decluttering process? 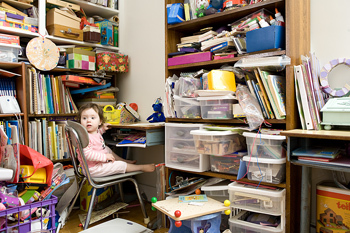 There are simple steps you can take in your daily life to prevent clutter in the first place. Starting now, say no to junk mail. As soon as you pick up a piece of mail that you know is junk mail, toss it in the recycle bin without wasting your time opening it. If you want coupons from an ad, make a list and cut out the coupons immediately before tossing the rest of the ad. Don’t save the junk mail for a later date. Better yet, register with the Mail Preference Service on the Direct Marketing Association website. According to an article from the The Daily Green, you pay $1 to have your name removed from mailing lists and your junk mail decreases by 75 percent in 90 days! When it comes to decluttering your desk with old bills and paystubs, most people are afraid they’ll either need this information in the future or that someone will get hold of a private account number or personal information. The first fear, that you’ll need the information in the future, is a difficult issue to work though. Usually, after filing income taxes and receiving your tax return, you won’t need past paystubs. Medical bills are usually safe to throw away after a year or two of keeping them. If you’re afraid of people getting a hold of personal information, invest in a paper shredder and recycle. Another daily or weekly change you can make toward decluttering is to stop coming home from the grocery store with plastic bags and stop keeping these plastic bags as an unforeseen future necessity. Only save enough plastic bags to reuse in small bathroom and bedroom garbage cans or for reusing at the grocery store on your next visit. Better yet, opt to purchase cloth bags for shopping. Keep these cloth bags in your car and away from your kitchen. These bags keep your grocery list down in size and prevent a pantry overload of half-eaten bags of chips. For even more decluttering, buy fruits and vegetables as snacks. These items can be displayed on the counter in a bowl as a decoration and as an edible snack! Aside from everyday changes, you can plan an annual cleanup of closets, cabinets, drawers and other closed quarters. Remove everything from the entity at hand and decide what to throw out. Because tossing clothes is one of the hardest decluttering jobs for most people, the best way to decide what to get rid of is to try everything on in your clothes closet. This method will help you realize what doesn’t fit and what isn’t acceptable in the current fashion market. To help you feel good about the process, don’t toss the garments in the garbage. Donate clothes to worthy causes, sell them on the Internet or in a garage sale, or reuse them as rags. Another area to annually declutter is the bookshelf. Each year, after you finish reading a book, it gets placed on a bookshelf that eventually is too small to hold all the weight. Remove the books and magazines that you’ll never read again and place them in boxes. Like the clothes, donate them to a worthy cause or a local library, try to sell them or recycle them. In the future, opt to read books and magazines from the library instead of purchasing a copy of every one of your reading materials. These steps will get you well on your way to decluttering your home! Very good steps on how to declutter. Many people seem to fall into routines of letting things “go” for too long. Some individuals just need a step-by-step plan sometimes to get on the right track. Great article on how to declutter your home.